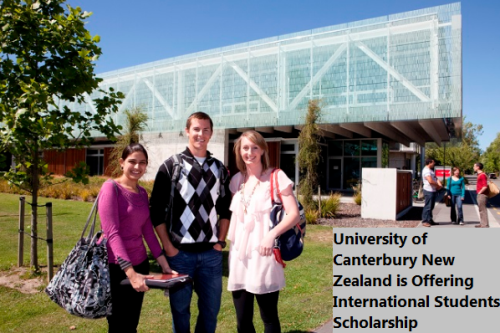 New Zealand: University of Canterbury is Offering International Students Scholarship for 2017/2018 Session. Home » Undergraduate Scholarship » New Zealand: University of Canterbury is Offering International Students Scholarship for 2017/2018 Session. This scholarship recognises and supports top-achieving international students commencing an undergraduate degree programme at the University of Canterbury. Applicants must be completing, or have completed on or after 1 January of the year before the year of application, a university entrance-level qualification that permits entry into a UC undergraduate degree programme (see regulations for details). Such students who are undertaking, or have completed, a programme at the UC International College are eligible to apply. have applied for Transfer of Credit from a New Zealand tertiary institution to an undergraduate degree programme at UC. Now that all the information about University of Canterbury is Offering International Students Scholarship has been delivered nicely; talented students who are eager to pursue their Free Tuition/Scholarships/Study in New Zealand for Undergraduate, Bachelors, Postgraduate, Masters, PhD, Associate Degree and Other Degrees, can apply now.